In May, 2016, I started a post doctoral position in a laboratory that focuses on weed management in agricultural systems, especially organic farms which don’t use chemical fertilizer or herbicide. My role is to integrate microbial ecology. For example, is the soil microorganism diversity different in fields that compete better against weeds than in fields that can’t? Are there certain microorganisms that make it easier for weeds to grow, and how do they do that? Can we suppress weeds by manipulating bacteria or fungi in the soil? So far, I’ve been doing field work for my project, as well as assisting other lab members in their own projects, as many large scale greenhouse or field experiments require large groups of helpers to accomplish certain tasks. I’m also new to weed ecology, and I wanted to learn as much as possible. Thus, I put on some sunscreen and one of those vendor t-shirts you get when you order a certain dollar amount, and got to work. Some of our projects investigate the link between crop health and climate change. To simulate climate change, we create rain-out shelters to mimic dry conditions, and plastic shielding to mimic hotter conditions. The gypsum block will absorb soil moisture, and we can measure conductivity off of that. This one is very dry. 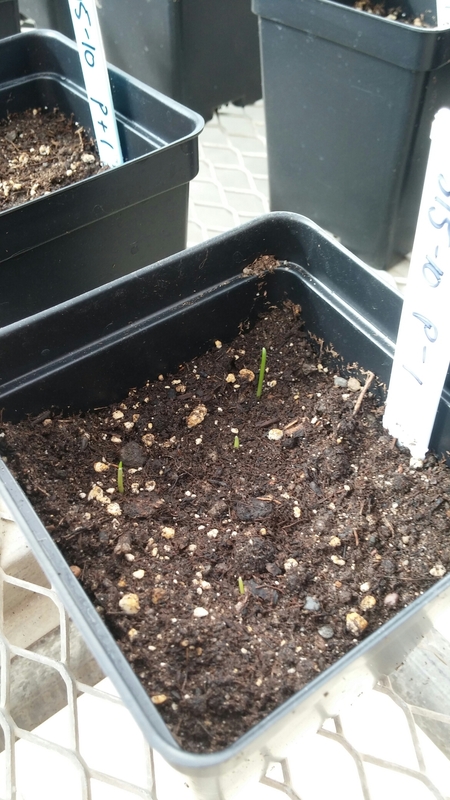 One of the treatments is to infect crops with wheat streak mosaic virus, to determine whether climate change will affect the plant’s ability to fight infection, and whether it will change soil microbiota. To do this, we needed to infect our crops, which meant growing infected plants in the laboratory and selectively spreading them in the field as a slurry. A similar project is using mites as a virus transmission vector, so we attached mite-infected wheat to healthy wheat. We hope the wheat mite get infected. Another project is collecting data about ground beetle diversity in organic versus conventionally farmed soil. For this, we planted pitfalls traps in fields to collect and identify beetles. Throughout many of the ongoing lab projects, I’ll be investigating the effect of treatments on soil health and diversity. The soil is then put in sterile containers until analysis. My project is part of a larger experiment, which also involves assessing crop and weed communities. For this, we need to randomly sample plants in the field and collect all above-ground plant material (to measure biomass as weight), as well as the biomass of each individual weed species to measure diversity (number of different weed species) and density (how large the plants are actually growing). And, of course, there is plenty of weed species identification!